Vladimir Konstantinovich Bukovsky (Russian: Влади́мир Константи́нович Буко́вский) (December 30, 1942 - ) is a notable former Soviet political dissident, author, and activist. He was one of the first to expose the use of psychiatric imprisonment against political prisoners in the Soviet Union. He spent a total of 12 years in Soviet prisons, labor camps and in "psikhushkas," forced-treatment psychiatric hospitals used by the regime as special prisons. In recent years, he has warned of the increased authoritarianism in Russia, and unsuccessfully attempted to register as a candidate for president in the 2008 election. 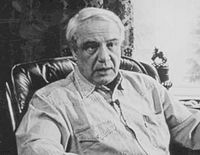 Vladimir Bukovsky was born in the town of Belebey, Bashkirian ASSR, Russian SFSR (now Bashkortostan), where his family was evacuated from Moscow during World War II. In 1959, he was expelled from his Moscow school for creating and editing an unauthorized magazine. From June 1963 to February 1965, Bukovsky was convicted under Article 70-1 of the Penal Code of the RSFSR and sent to a psikhushka for organizing poetry meetings in the center of Moscow (next to the Mayakovsky monument). The official charge was an attempt to copy anti-Soviet literature, namely The New Class by Milovan Djilas. In December 1965, he organized a demonstration at Pushkin Square in Moscow in defense of the writers Andrei Sinyavsky and Yuli Daniel (see Sinyavsky-Daniel trial). Three days before the planned demonstration, Bukovsky was arrested. He was kept in various psykhushkas without charges until July 1966. In January 1967, he was arrested for organizing a demonstration in defense of Alexander Ginzburg, Yuri Galanskov, and other dissidents (the charge was violation of Article 190-1, which carried three years of imprisonment); he was released in January 1970. In 1971, Bukovsky managed to smuggle to the West over 150 pages documenting abuse of psychiatric institutions for political reasons in the Soviet Union. The information galvanized human rights activists worldwide (including inside the country) and was a pretext for his subsequent arrest the same year. At the trial, in January 1972, Bukovsky was accused of slandering Soviet psychiatry, contact with foreign journalists, and possession and distribution of samizdat (he was charged with Article 70-1, and sentenced to seven years of imprisonment plus five years in exile). Together with a fellow inmate in the prison camp No. 35 near Perm, psychiatrist Semyon Gluzman, he coauthored A Manual on Psychiatry for Dissidents in order to help other dissidents fight abuses of the authorities. The fate of Bukovsky and other political prisoners in the Soviet Union, repeatedly brought to attention by Western human rights groups and diplomats, was a cause of embarrassment and irritation for the Soviet authorities. On December 18, 1976, while imprisoned, Bukovsky was exchanged for former Chilean Communist leader Luis Corvalán. In his autobiographical book, To Build a Castle, Bukovsky describes how he was brought to Switzerland handcuffed. Since 1976, Bukovsky has lived in Cambridge, England, focusing on neurophysiology and writing. He received a Masters Degree in Biology and has written several books and political essays. In addition to criticizing the Soviet regime, he also picked apart what he calls "Western gullibility," a lack of a tough stand by Western liberalism against Communist abuses. In 1983, together with Vladimir Maximov and Eduard Kuznetsov he co-founded and was elected president of the international anti-Communist organization Resistance International (Интернационал сопротивления). In April 1991, Vladimir Bukovsky visited Moscow for the first time since his forced deportation. In the run-up to the 1991 presidential election Boris Yeltsin's campaign considered Bukovsky as a potential vice-presidential running-mate (other contenders included Galina Starovoitova and Gennady Burbulis). In the end, the vice-presidency was offered to Alexander Rutskoi. Having failed to finish off conclusively the communist system, we are now in danger of integrating the resulting monster into our world. It may not be called communism anymore, but it retained many of its dangerous characteristics…. Until the Nuremberg-style tribunal passes its judgment on all the crimes committed by communism, it is not dead and the war is not over. It took several years and a team of assistants to compose the scanned pieces together and publish it. The same collection of documents is also massively quoted in Bukovsky's Judgement in Moscow, which was published in 1994, translated into many languages and attracted international attention. In 1992, a group of liberal deputies on the Moscow City Council proposed Bukovsky's candidacy for elections of the new Mayor of Moscow, following the resignation of the previous Mayor, Gavriil Popov. Bukovsky refused the offer. In early 1996 a group of Moscow academics, journalists and intellectuals suggested that Bukovsky should run for President of Russia as an alternative candidate to both incumbent President Boris Yeltsin and his Communist challenger Gennady Zyuganov. No formal nomination was initiated. In any case, Bukovsky would not have been allowed to run, as the Russian Constitution stipulates that any presidential candidate must have lived in the country continuously for ten years prior to the election. In 1997, during the General Meeting in Florence, Bukovsky has been elected General President of the Comitatus pro Libertatibus- Comitati per le Libertà- Freedom Committees, the international movement aimed to defend and empower everywhere the culture of liberties. Re-elected since then, Bukovsky promoted together with Dario Fertilio and Stéphane Courtois, a writer and an historian, the Memento Gulag, or Memorial Day devoted to the victims of communism and totalitarian regimes, to be held each year, on November 7 (anniversary of the Bolshevik Revolution). Since then, the Memento Gulag has been celebrated in Rome, Bucharest, Berlin, La Roche sur Yon, and Paris. In 2002, Boris Nemtsov, a member of the Russian Duma (parliament) and leader of the Union of Right Forces, and former Deputy Prime Minister of Russia, visited Vladimir Bukovsky in Cambridge to discuss the strategy of the Russian opposition. Bukovsky told Nemtsov that, in his view, it is imperative that Russian liberals adopt an uncompromising stand toward what he sees as the authoritarian government of President Vladimir Putin. In January 2004, together with Garry Kasparov, Boris Nemtsov, Vladimir V. Kara-Murza and others, Vladimir Bukovsky co-founded the Committee 2008, an umbrella organization of the Russian democratic opposition, whose purpose was to ensure free and fair presidential elections in 2008. In 2005, Bukovsky participated in They Chose Freedom, a four-part documentary on the Soviet dissident movement. In 2005, with the revelations about captives in Guantanamo, Abu Ghraib and the CIA secret prisons, Bukovsky criticized the rationalization of torture. Bukovsky warned about some parallels between the formations of the Soviet Union and European Union. Vladimir Bukovsky is a member of the Board of Directors of the Gratitude Fund, and a member of the International Council of the New York-based Human Rights Foundation. In the United Kingdom, he is Vice-President of The Freedom Association (TFA) and a patron of the United Kingdom Independence Party (UKIP). On the May 28, 2007, Bukovsky agreed to become a candidate in the Russian presidential election. The group that nominated Bukovsky as a candidate included Yuri Ryzhov, Vladimir V. Kara-Murza, Alexander Podrabinek, Andrei Piontkovsky, Vladimir Pribylovsky and others. Activists and writers Valeria Novodvorskaya, Victor Shenderovich, Vladimir Sorokin favored Bukovsky. In their answer to pro-Kremlin politicians and publicists who expressed doubt about Bukovsky's electoral prospects, his nominators refuted a number of frequently repeated statements. 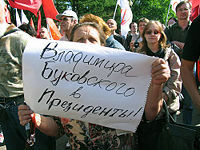 More than 800 participants nominated Bukovsky for president on December 16, 2007, in Moscow. Bukovsky secured the required turnout and submitted his registration to the Central Election Commission on December 18, 2007. The Election Commission turned down Bukovsky's application on December 22, 2007, claiming that he failed to give information on his activity as a writer when submitting documents to the Election Commission, that he was holding a British residency permit, and that he has not been living on Russian territory over the past ten years. Bukovsky appealed the decision in Supreme Court on December 28, 2007, then in its cassation board on January 15, 2008. Soviet Archives, collected by Vladimir Bukovsky, prepared for electronic publishing by Julia Zaks and Leonid Chernikhov. List of publications of Vladimir Bukovsky at The Gratitude Fund. EUSSR: The Soviet Roots of European Integration, 2004. ISBN 0-9540231-1-0. Soul of Man Under Socialism. 1979. ISBN 089633029X. Soviet Hypocrisy and Western Gullibility. 1987. ISBN 089633113X. Judgement in Moscow (Московский процесс) based on his 1992 visit to Russia and the "Soviet Archives." To Choose Freedom. (Hoover Institution), Stanford University, 1987. ISBN 0817984429. ↑ V. Bukovsky, A Manual on Psychiatry for Dissidents ("Пособие по психиатрии для инакомыслящих"). Retrieved July 8, 2008. ↑ Info-Russ, Soviet Archives. Retrieved September 9, 2008. ↑ Jamie Glazov, The Cold War and the War Against Terror. Retrieved September 9, 2008. ↑ Vladimir Kara-Murza, They Chose Freedom. Retrieved September 9, 2008. ↑ The Washington Post, Torture's Long Shadow. Retrieved July 8, 2008. ↑ Paul Belien, Former Soviet Dissident Warns For EU Dictatorship. Retrieved July 8, 2008. ↑ Prima News, Vladimir Bukovsky Will Run for President of Russia in 2008. Retrieved September 9, 2008. ↑ Prima News, Statement by the Initiative group nominating Vladimir Bukovsky a candidate for Russian Federation president. Retrieved September 9, 2008. ↑ Prima News, Victor Shenderovich and Yuri Shmidt supported the candidacy of Vladimir Bukovsky. Retrieved September 9, 2008. ↑ On judicial aspects of nominating Vladimir Bukovsky a candidate for president of Russian Federation. Retrieved September 9, 2008. ↑ Echo of Moscow, The candidature of Soviet dissident Vladimir Bukovsky nominated for president. Retrieved September 9, 2008. ↑ RIA Novosti, Soviet dissident Bukovsky pulls out of presidential race. Retrieved September 9, 2008. ↑ Interfax News Agency, Refusal to register Bukovsky's initiative group is legal—court. Retrieved September 9, 2008. ↑ Bukovsky Initiative Group, Supreme Court completely rejected Bukovsky's registration. Retrieved September 9, 2008. Bukovskii, Vladimir Konstantinovich. To Choose Freedom. Hoover Institution Press, 1987. ISBN 9780817984427. Deutscher, Tamara, and Zuzana Bluh-Sling. Political Prisoners in Czechoslavakia and the USSR: the Struggle for Socialist Democracy. Bertrand Russell Peace Foundation, 1975. ISBN 9780851241142. Podell, Janet, and Steven Anzovin (eds.). The Soviet Union. Wilson, 1988. ISBN 9780824207663. This page was last modified on 23 January 2016, at 16:31.